Two important moral words to carry around in your moral toolbox are “yes” and “no.” They are the voice of softer and sterner virtues. “Yes” is a much nicer word to say and hear. It is softer, welcoming, and optimistic. It even tastes good coming out of your mouth. 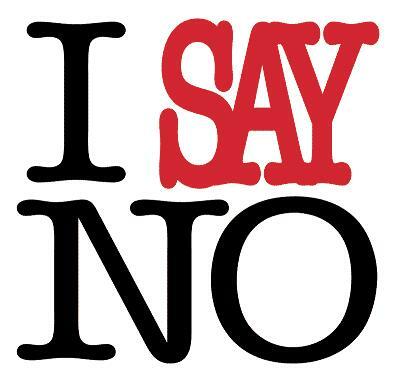 “No” is more curt (33% less by letter count! ), often packaged with a phrase instead of long welcoming sentence, and can be sour to the taste. Say it too often and your face starts shrinking and wrinkling. But NO is an essential moral voice for us to cultivate. There are softer moral Christian virtues and those are more in favor lately, in our Christian music and even in the softness of the guitars and chords we use in that music. The organ and those hymns sound too harsh to many Christians. We talk of mercy and compassion, exceptions to rules. Yes, be nicer. Its good Christian advice. Its even better moral advice. But if you throw out the stern virtues, you are headed for hell’s hole. It is not a pretty world if we only have the soft virtues. You are going to have to have sterner moral Christian virtues and here Jesus’s life and work also helps. Chasing money chasers out of places, eluding rigid Pharisees and nasty lawyers with carefully crafted come-backs, or dispersing crowds that want to make you king took some amazing focus, discipline and force of character. My family and I watched 42, the movie about Jackie Robinson, the first African American to plan in modern era of Major League Baseball (MLB). We like doing a thanksgiving vacation fill and it has been It’s A Wonderful Life in the past, but this year my daughter wanted us to see this. It was a wise choice. Robinson played in major league traditional baseball for the Dodgers. He was a man with amazing set of sterner virtues in a time that required him to stand up to an amazing amount of abuse. He learned to control his temper but that didn’t mean he needed to throw away his wrath or anger. In the Christian life, you can’t hate (bitter abusive desiring) but you should learn to cultivate and manage godly anger (sense of injustice and need for change) in your work place and home. He seemed to have that ability in baseball. Those sterner virtues helped him bring American baseball and America in general to a greater experience of equality. Those virtues also helped the manager who had the idea of hiring Robison stay strong, Branch Rickey was a mix of virtues, but he had the right set for that time. We need courage, the ability to say no (mostly to ourselves), and we need to toughen up and stay frugal, just, accurate, trustworthy, committed, and sacrificial. This is the sterner stuff of morality. I believe this is one contribution that disciplined people make to our moral world. I know several financial planners and department managers who take the joy out of spending money, but if they didn’t none of us would have any money to spend. We need accountability and we will get it, sooner or later, and for most, the lack of accountability leads to financial ruin and abusive homes. There is a final judgment not only for those without mercy but also for those without sterner virtues of justice. In the film 42, another scene shows what moral sternness is. Branch Rickey, was being told by another manager he didn’t want the black player playing when he came to their city. Rickey is shrewd and says that he would be glad to let the other team forfeit as the Dodgers don’t mind winning by forfeit. He then reminds the other manager that when he faces the God who loves baseball, he is going to have to explain why he acted the way he did. Stern stuff this judgment talk can be to some. Managers get labeled as pencil pushers but are often the only voice of stern virtues in some organizations and communities. In a world intoxicated by its dreams and unwilling to endure the discipline and trial of a season to have a good crop, we need more “pencil pushers” to remind us of budgets, policies, requirements and regulations and compliance. These managers often get sour faces because we workers should be saying no more often to ourselves, knowing that frugality is a god thing as much as liberality and generosity. Letting one spouse or one person carry that responsibility is not good for them and not good for us. They remind us of budgets, sacrificial commitment, and staying out of debt, materialism and luxuries and pay a dear price to have to do that, when we ourselves should shoulder that concern. Since tomorrow is Black Friday, what sterner virtues might you we all need to live by to maintain more frugal lives. A cartoon I used to show in class shows a scene where a couple is meeting with a debt counselor and responding to his questions of why they got into so much debt. There response is that “Everything was so affordable.” As Dave Ramsey reminds us, we have gotten too used to debt and need to run from it like a gazelle from a lion. Stern realities need stern virtues. As a child born into an upper middle class home in Californian, the Midwest turned out to be a great training ground for sterner virtues. I learned to work in California, but the last 15 years have done more for my moral understanding. It is cold, really cold here. You better prepare for it, plan ahead and buy quality boots. Flip-flops won’t make it. Too many people have a flip-flop morality. Yes, I wish we all had more California in our blood and we need group hugs and niceties but we also need to stretch a dollar, sacrifice for the neighbors next to us and I have seen in my days in Ohio and Michigan that deep stern virtue of sacrifice and faithfulness and have a better view of God as a result. I learned that if you want to be a church leader you really have to learn to deal with a lots of problems and have the ability to set boundaries. Getting rid of TV watching was the best thing we ever did, followed by a faithful vegan lifestyle. “Discipline is not the enemy of enthusiasm” as Joe Clark reminds us in the classic film about reforming a high school. Stern words from a stern woman to an overly stern man. (Those who have trouble with prophetic sternness might study Psalms 18:22-27). In my favorite White book, Ministy of Healing: “The father should enforce in his family the sterner virtues–energy, integrity, honesty, patience, courage, diligence, and practical usefulness. And what he requires of his children he himself should practice, illustrating these virtues in his own manly bearing. But, fathers, do not discourage your children. Combine affection with authority, kindness and sympathy with firm restraint. Give some of your leisure hours to your children; become acquainted with them; associate with them in their work and in their sports, and win their confidence.”(Ministy of Healing 391, 392). Don’t worry about saying no. It is a good moral voice to work on. Just watch out for those wrinkles! !